BOSINVER FARM COTTAGES OFFER AWARD-WINNING SELF-CATERING HOLIDAYS IN CORNWALL FOR ALL THE FAMILY. 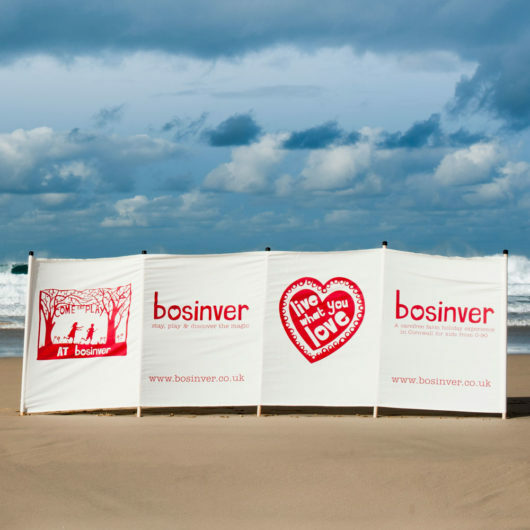 South Westerly Windbreaks produced a promotional windbreak for each of Bosinver’s 20 child-friendly, lovingly decorated holiday cottages. Each holiday cottage has its own windbreak allowing the holiday maker to take it around Cornwall with them, thus advertising Bosinver Farm Cottages wherever they may go. A great example of a clever and useful advertising space.